A backflow preventer can be used to protect water supplies from toxic contamination or pollution as a result of backflow. In water supply systems, water is generally maintained at a substantial pressure to allow water to flow from the faucet, bathtub and so on. When pressure fails or is decreased as could happen if a water main breaks, pipes freeze or there's surprisingly high demand on the water system, the pressure within the pipe could be reduced and may even allow polluted water from the ground, from storage or from other places to be pulled into the system. Back pressure is yet another way that an unhealthy contaminant may possibly get into your location's water piping. Sources of back pressure could be pumps in the water distribution system, boilers, heat exchanging devices, or even power washing equipment. In these instances, there might be an almost continuous risk of overcoming the static water pressure inside the piping. 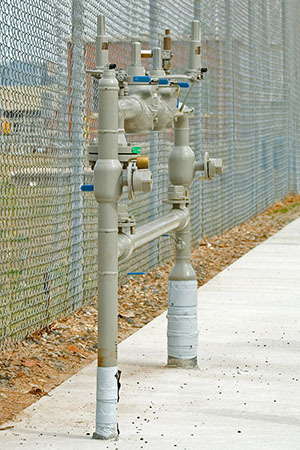 To reduce the potential risk of contamination, a backflow preventer may be installed. A backflow preventer can also be important when chemicals are used, for example for commercial/industrial descaling (boilers) or when bleaches are used for commercial power washing. It's important to have our fluid meter company take care of your backflow preventer testing on a routine basis so you can rest assured knowing that it's operating correctly. It's recommended that you have your backflow preventer tested regularly (once a year) so you know your location's water supply is safe. Fluid Meter Service Corporation offers affordable backflow preventers for homes and businesses in the greater Austin area and nationwide. Do not hesitate to contact us for more information about buying a backflow preventer for your location.